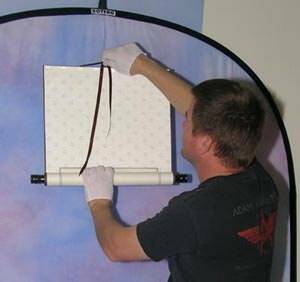 Looking for How We Make Wall Scrolls? 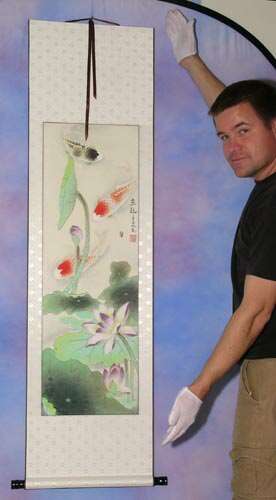 Your wall scroll is going to look great when you hang it up on your wall. But there are some things that you should know, and some steps that you should take to ensure the best presentation and long life of your new Asian art. 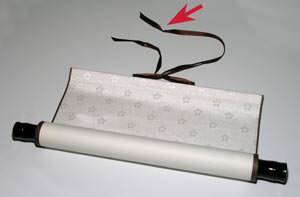 When your wall scroll arrives it will be rolled up and tied with its own ribbon. The ribbon will be a little kinked & wrinkled from being tied, so you'll want to straighten it out. You'll probably want to make the tails of your ribbon flat and wrinkle-free. 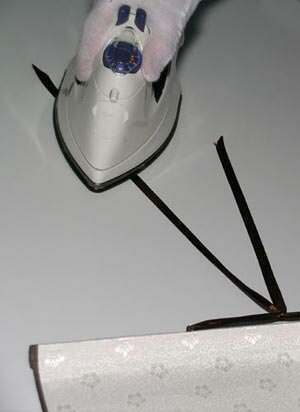 It doesn't take much heat to do this, and be sure to keep your iron moving so that you don't accidentally melt the ribbon. If you accidentally mess up your ribbon, just contact us and we'll send you a new one at no charge. If you do this, just be sure to cut them at a nice angle with really sharp scissors. This might be going overboard, but you can also lightly melt the end of your ribbon with a lighter. 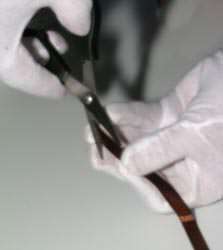 This will ensure that in the event of a nuclear detonation, the ends of your ribbon will still be crisp and unfrayed. 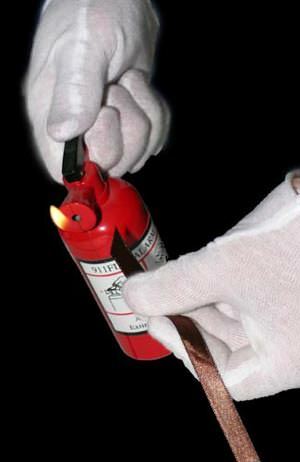 In this picture, I am using the always popular "fire extinguisher lighter", a form of hand-held oxymoron available exclusively in China. To add an element of danger, I am also still wearing my highly-flammable cotton gloves. You can use a simple nail to hang your scroll on your wall. But for extra security, I suggest a "picture frame hook" (as shown on the left) or a screw-in hook (as shown on the right). Never let your scroll just drop!!! 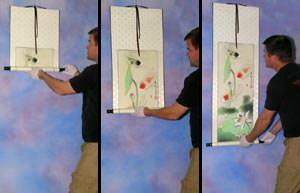 Guide your wall scroll down slowly. The final step is straightening up the ribbons so that your scroll looks its best. In case you are wondering, I am wearing white cotton gloves because they protect the artwork from the acidic oils that can be found on human hands. It's probably overkill, but I always handle your artwork with gloved hands when it's photographed, and packed for shipment. Contrary to popular belief, it's not just because I have a box full of inspection gloves left over from my time in the U.S. Marines.